Traditional in the Dominican Republic, this Three Cheese Plantain Casserole is a cheesy and hearty side dish – a favorite of mine while growing up (and still is)! You’re looking for a young yellow plantain, if that makes any sense. A green plantain that just turned yellow, maybe with a couple of brown spots, but not overwhelmingly spotted. You want a bit of sugars (ripe) but the riper the plantains, the mushier they are in my opinion. You want a sturdier plantain that can hold up to mashing and baking. Thus, a “young yellow plantain” is what you need. If you’ve never cooked with plantains, this is the perfect recipe to start with. It’s perfect for dinner whens served alongside a grilled protein like chicken or steak, works well for lunch or even breakfast when topped with a fried egg. Basically, because I’m Dominican, I can work plantains into any time of the day! 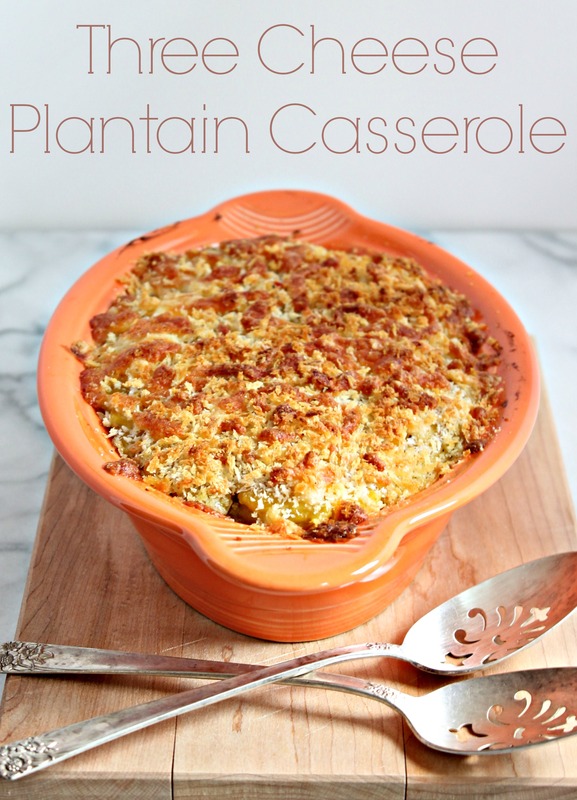 Please let me know what you think of this plantain casserole! This Three Cheese Plantain Casserole is a classic casserole served in the Dominican Republic - I'm sure it'll become a favorite of your family as well! While water reaches boil, peel and cut plantains into 2 inch pieces. Place plantains and boil over medium heat until fork tender. Reserve ½ cup boiling water. In a large bowl, mash plantains with salt and pepper, drizzling the water until a smooth consistency is reached. Preheat oven to 400F and grease a small baking pan (8x8 works well). Place half the mashed plantains on the bottom of the pan, place clumps of cream cheese all over. Place the rest of the mashed plantains over the cream cheese. In a small bowl mix the cheddar, mozzarella, and panko. Sprinkle over plantain and bake until golden brown.